Monocytes. 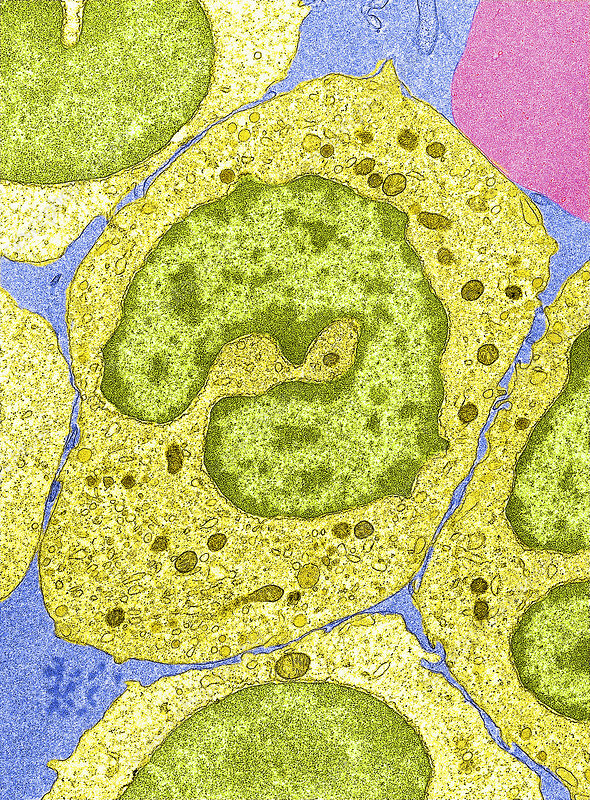 Coloured transmission electron micrograph (TEM) of monocyte cells (yellow). Monocytes are a type of white blood cell (leucocyte), part of the body's immune system, that are found in the circulating blood. The kidney-shaped nucleus (green) is a typical feature of these cells. Monocytes protect against blood-borne pathogens by phagocytosing (engulfing) them and then presenting the digested parts on their cell surfaces. This presentation allows other immune system cells, such as T cells, to recognise the pathogens so that they can be killed quickly. Magnification: x6125 when printed 10 centimetres tall.